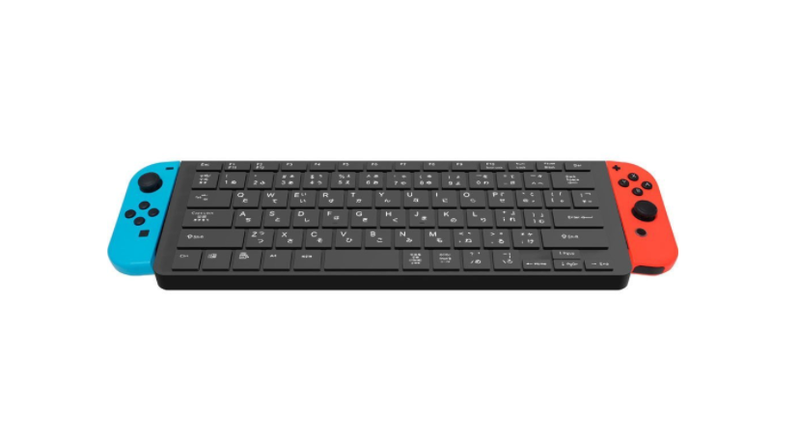 With upcoming massively multiplayer online role-playing game Dragon Quest X coming to the Nintendo Switch this September in Japan, peripheral makers are readying Switch friendly keyboards. This Cyber Gadget one is something else. No idea if it’s actually any good, but it certainly does bring back memories of this Game Cube keyboard controller. The keyboard doesn’t come with Joy-Con controllers (obviously! ), but it’s possible to use them while docked in the mini keyboard. At 250 grams, the keyboard is light, so it seems the idea is that players will keep it attached. The concept is different from Hori’s compact keyboard for the Switch, which doesn’t allow for Joy-Con docking. I’m not exactly sure which would be better to use, but the Cyber Gadget one sure is striking. Since Dragon Quest X is Japan only and because these are Japanese keyboards, it’s unclear if these peripherals will ever get an international release.